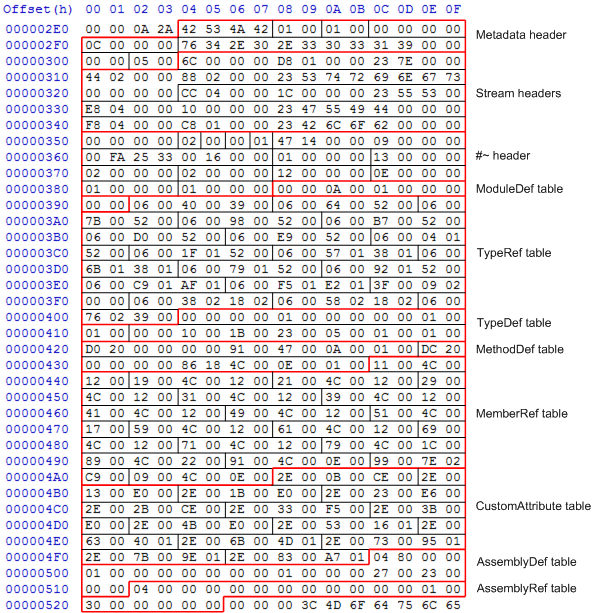 Any close look at the method definitions in a .NET assembly has to start off with the method’s information in the metadata tables – the MethodDef. So lets do that. D0 20 00 00: RVA. The RVA of the method body within the assembly (0x20d0). 00 00: ImplFlags. Various flags indicating how the method is implemented. All-zeros indicate this is a pure-IL managed method. 91 00: Flags. In this example, these flags indicate this method is declared private static hidebysig. 47 00: Name. offset into #Strings heap (‘Main’). 0A 00: Signature. Offset into #Blob heap containing the signature (return type & parameter types) of the method. I might look at signature encodings in a later post. In this example, the bytes at this offset indicate a method with no parameters and a void return type. 01 00: ParamList. A RID to the ParamDef table with information on the method’s parameters. As this method has no parameters, and there is no ParamDef table in the assembly, this is essentially ignored. You’ll notice there’s no reference to the owning TypeDef within a MethodDef. In an assembly, associations like this are one-way – in order to find which type owns a particular method, you have to scan the TypeDef table until you find a type that includes the method in its method list. So, a MethodDef describes the basic properties of a method – its name, signature, and implementation details. What about the actual body of a method? How are these bytes interpreted? To start with, we have to understand a bit about CIL opcodes. CIL uses a variable-length instruction encoding; each opcode can be represented by 1 or 2 bytes, with all the commonly-used instructions using 1 byte. After the opcode are bytes representing the argument to that instruction, if there is one. There are usually two versions of instructions that take an argument, a short version and a long version. For example, the ldarg instruction (load argument) is a 2-byte instruction that takes a 2-byte argument with the argument number to be loaded. However, very few methods are going to have argument lists with more than about 10 arguments, so the ldarg.s 1-byte instruction takes a single byte with the argument number. And, in fact, IL takes this a step further, as there are separate ldarg.0, ldarg.1, ldarg.2 and ldarg.3 instructions to load the first 4 method arguments in only 1 byte. Since ldarg.1 is likely to be used many, many times within an assembly, this saves a lot of space. 0x6f is the encoding for the callvirt instruction, and the token argument is pointing to the 5th row of the MemberRef table (table number 0x0a), which will have the name and signature of the Object.ToString() method. Again, there’s a header at the start of the method body. And, in a similar way to the instruction encoding, there are two formats for the header depending on what needs to be specified, a thin format and a fat format. The first two bits of the first byte specify which header this is. If any of these do not apply, then the fat header needs to be used, which is 12 bytes long. This header specifies the maximum number of items on the stack, a token to the locals signature in the StandAloneSig metadata table, and a flag indicating if there are exception handling tables after the method body. Thin headers are typically used for simple property getter & setters, which usually do no more than a load field & return or load argument & store field. 0x28 is the opcode for the call instruction, again with a 4-byte token argument. This is a normal token, and refers to the 17th entry in the MemberRef table. If we have a look back at the metadata tables the 17th row in the MemberRef table has the bytes 99 00 7E 02 C9 00. This points to the TypeRef for System.Console, “WriteLine” in the #Strings heap, and the method signature void(string). This is everything the CLR needs to know to work out which method to call. 0x2a is the opcode for the ret instruction, which takes no arguments. As you can see, this is actually a very simple “Hello World” program. 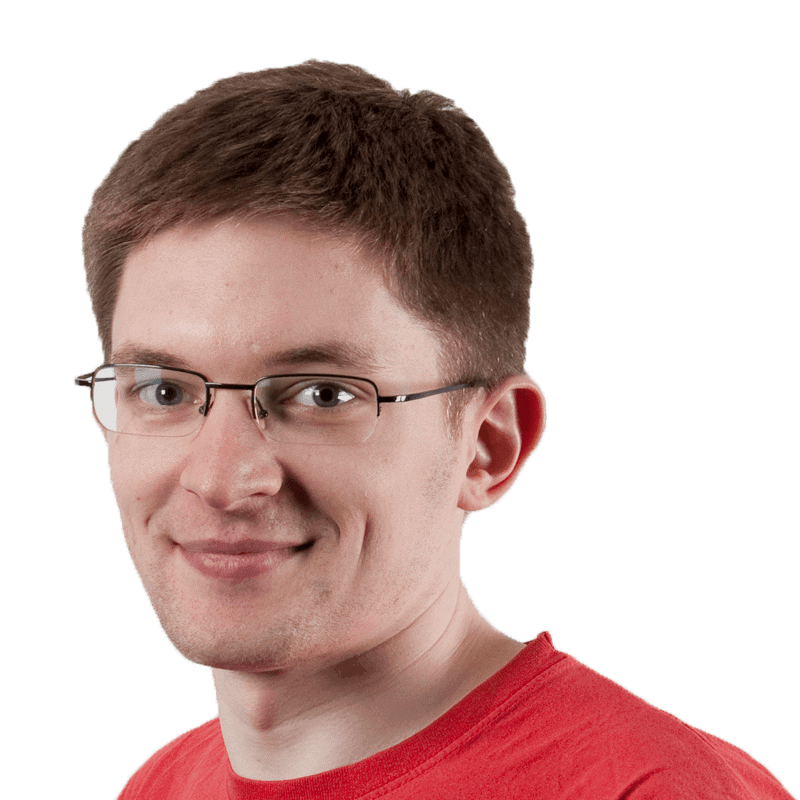 I hope this series of posts has given you an insight into how data is actually stored in a .NET assembly. Please do comment or email me if there’s anything you want me to have a look at in more detail. That’s not the end of the series; the next few posts will have a look at the DOS and CLR loader stubs that are part of every assembly – why they are there, and what they do.